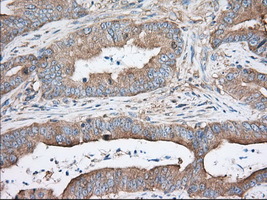 Western Blot analysis of TTC32 expression in transfected 293T cell line (H00130502-T01) by TTC32 MaxPab polyclonal antibody.Lane 1: LOC130502 transfected lysate(16.61 KDa).Lane 2: Non-transfected lysate. 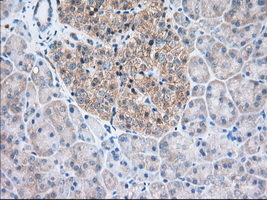 Western Blot analysis of TTC32 expression in transfected 293T cell line (H00130502-T02) by TTC32 MaxPab polyclonal antibody.Lane 1: LOC130502 transfected lysate(16.61 KDa).Lane 2: Non-transfected lysate. 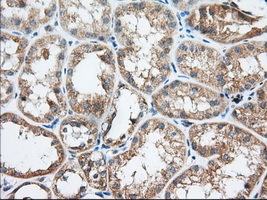 Anti-TTC32 mouse monoclonal antibody (TA501337) immunofluorescent staining of COS7 cells transiently transfected by pCMV6-ENTRY TTC32(RC209334). 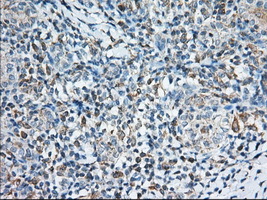 HEK293T cells were transfected with the pCMV6-ENTRY control (Left lane) or pCMV6-ENTRY TTC32 (RC209334, Right lane) cDNA for 48 hrs and lysed. 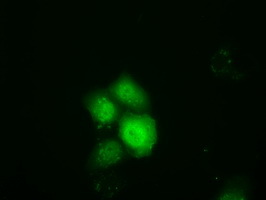 Equivalent amounts of cell lysates (5 ug per lane) were separated by SDS-PAGE and immunoblotted with anti-TTC32. 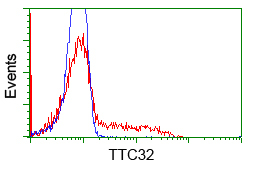 Flow cytometric Analysis of Jurkat cells, using anti-TTC32 antibody(TA501337),(Red), compared to a nonspecific negative control antibody(TA50011),(Blue). 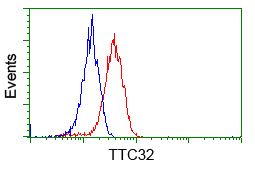 HEK293T cells transfected with either RC209334 overexpress plasmid(Red) or empty vector control plasmid(Blue) were immunostained by anti-TTC32 antibody(TA501337), and then analyzed by flow cytometry. 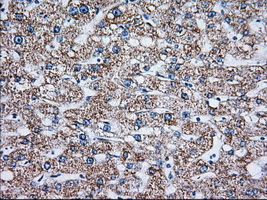 Anti-TTC32 mouse monoclonal antibody (TA501338) immunofluorescent staining of COS7 cells transiently transfected by pCMV6-ENTRY TTC32(RC209334). 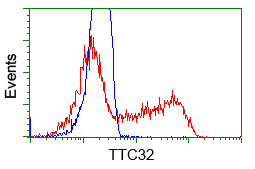 HEK293T cells transfected with either RC209334 overexpress plasmid(Red) or empty vector control plasmid(Blue) were immunostained by anti-TTC32 antibody(TA501338), and then analyzed by flow cytometry. HEK293T cells transfected with either RC209334 overexpress plasmid(Red) or empty vector control plasmid(Blue) were immunostained by anti-TTC32 antibody(TA501339), and then analyzed by flow cytometry. 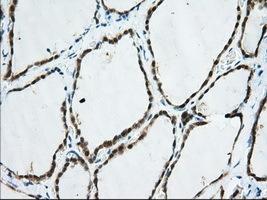 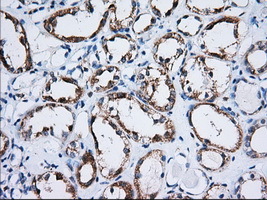 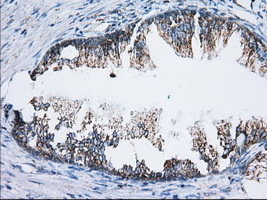 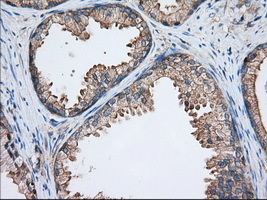 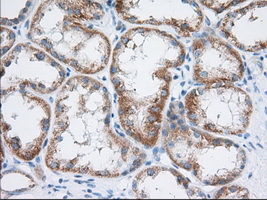 Anti-TTC32 mouse monoclonal antibody (TA501340) immunofluorescent staining of COS7 cells transiently transfected by pCMV6-ENTRY TTC32(RC209334). 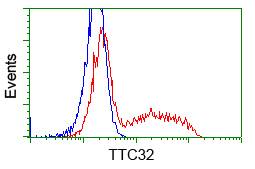 HEK293T cells transfected with either RC209334 overexpress plasmid(Red) or empty vector control plasmid(Blue) were immunostained by anti-TTC32 antibody(TA501340), and then analyzed by flow cytometry. 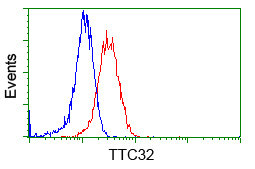 HEK293T cells transfected with either RC209334 overexpress plasmid(Red) or empty vector control plasmid(Blue) were immunostained by anti-TTC32 antibody(TA501341), and then analyzed by flow cytometry. 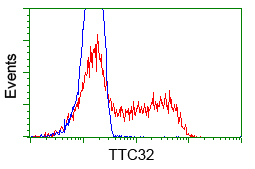 Flow cytometric Analysis of Hela cells, using anti-TTC32 antibody(TA501341),(Red), compared to a nonspecific negative control antibody(TA50011),(Blue). 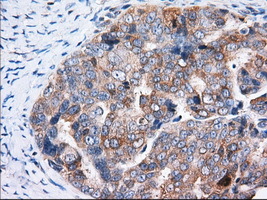 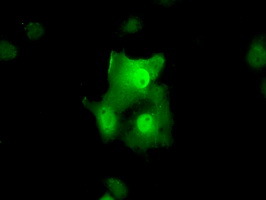 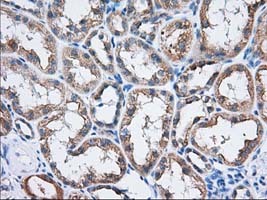 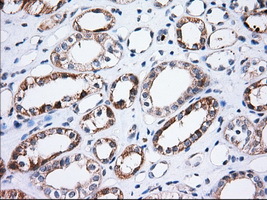 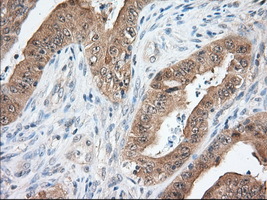 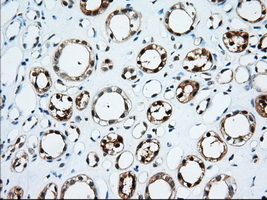 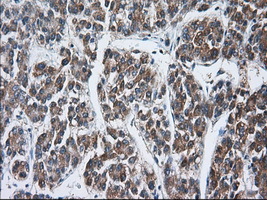 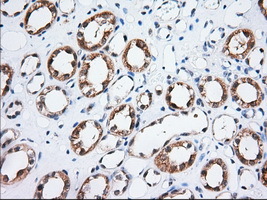 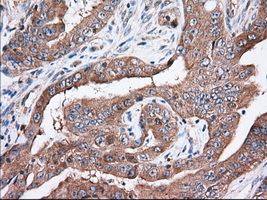 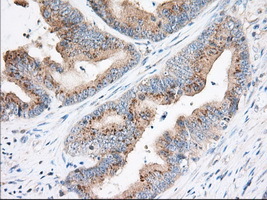 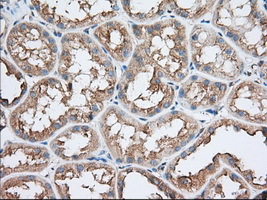 Anti-TTC32 mouse monoclonal antibody (TA501342) immunofluorescent staining of COS7 cells transiently transfected by pCMV6-ENTRY TTC32(RC209334). HEK293T cells transfected with either RC209334 overexpress plasmid(Red) or empty vector control plasmid(Blue) were immunostained by anti-TTC32 antibody(TA501342), and then analyzed by flow cytometry. 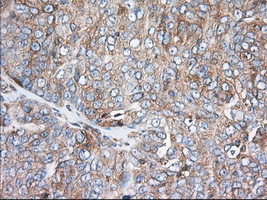 Anti-TTC32 mouse monoclonal antibody (TA501343) immunofluorescent staining of COS7 cells transiently transfected by pCMV6-ENTRY TTC32(RC209334). 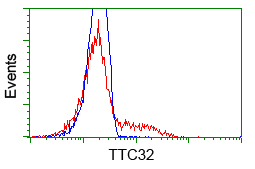 HEK293T cells transfected with either RC209334 overexpress plasmid(Red) or empty vector control plasmid(Blue) were immunostained by anti-TTC32 antibody(TA501343), and then analyzed by flow cytometry. 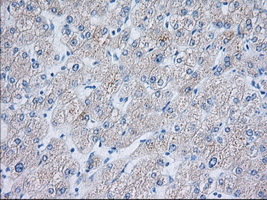 HEK293T cells transfected with either RC209334 overexpress plasmid(Red) or empty vector control plasmid(Blue) were immunostained by anti-TTC32 antibody(TA501344), and then analyzed by flow cytometry. 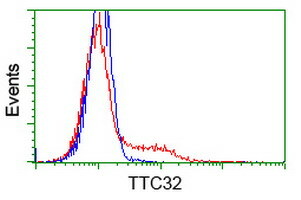 HEK293T cells transfected with either RC209334 overexpress plasmid(Red) or empty vector control plasmid(Blue) were immunostained by anti-TTC32 antibody(TA501345), and then analyzed by flow cytometry. 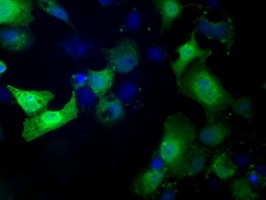 Anti-TTC32 mouse monoclonal antibody (TA501367) immunofluorescent staining of COS7 cells transiently transfected by pCMV6-ENTRY TTC32(RC209334). HEK293T cells transfected with either RC209334 overexpress plasmid(Red) or empty vector control plasmid(Blue) were immunostained by anti-TTC32 antibody(TA501367), and then analyzed by flow cytometry. 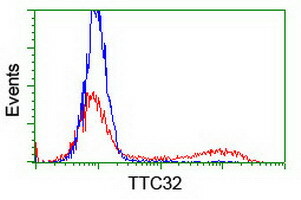 HEK293T cells transfected with either RC209334 overexpress plasmid(Red) or empty vector control plasmid(Blue) were immunostained by anti-TTC32 antibody(TA501368), and then analyzed by flow cytometry.